(article massively updated on 10th Febuary 2008, and then again on 9th May 2008 (latest). (article first created on 27th March 2005). It's been almost three years since we last reviewed and compared these music giants back in 2005. A lot has changed since then. Thanks to the popularity of our last comparison, we've 1-upped ourselves, and put the latest versions of MediaMonkey (3.01), iTunes (v7.6), Winamp (5.51) versus a new heavyweight - Windows Media Player (v11.0.5) - head to head for another battle extraordinaire. All four players have been feature enriched and it's not all that obvious which is the winner this time. A big thanks to all the people who have helped iron out some errors, typos, and missing features in the old page. We've taken into account all your suggestions, from emails, forums, boards, and blogs, so this new rematch should now be more accurate and comprehensive. As before, we will run the programs on Windows XP, focusing on the basic operation, including file types, searching features, tagging, and the speed of the program. Less emphasis will be put on things like video, podcasting, syncing, and store shops, but they will get a look at least. The version of Mediamonkey reviewed is the paid 'Gold' version which includes a few extra features over the free version, including faster CD/DVD burning (4x->48x), a 'File Monitor' (files saved to HD are automatically updated in library), support for multiple collections (e.g. rock & classical), better searching and other stuff. 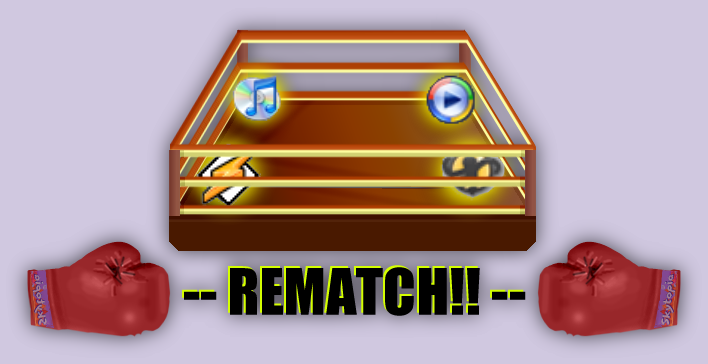 This rematch was first created on the 31st January 2008 and updated on 10th Feb 2008, and again on the 9th May 2008. This first section will just display some eye candy for those who want to see what's in store. ABOVE: The classic, fast view for nostalgia and speed demons. ABOVE: The latest skin - "Bento". 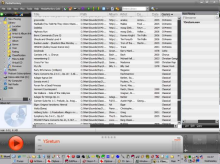 Winamp (and Mediamonkey), have loads of skins available for download if you're not happy with the ones you get as standard. Mediamonkey also offers a "MicroPlayer" (not shown), as well as the usual "MiniPlayer". This reduces Mediamonkey to the system tray. A simple right-click will prompt a handy mini-menu to control the player. Nice! 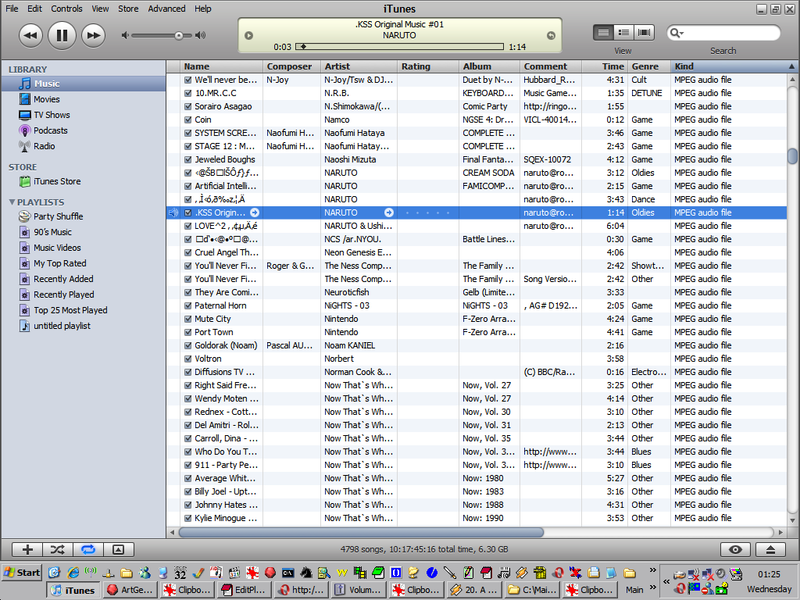 iTunes interface - clean and simple. The play button doubles up as pause. The last and smallest mini-viewer for WMP is supposed to go into the task bar area, but I was unable to, due to it not being listed in the Toolbars submenu. iTunes supports (and converts out to) CDA, MP2, MP3, AIFF, WAV, AAC/MPEG-4, Apple Lossless. According to Wikipedia, in theory it should also read in Apple's QuickTime supported formats such as AU and AVI formats amongst others, but my copy of iTunes failed to import those files into the library (MIDI made it through though). OGG is supported if you install the appropriate plugin. Mediamonkey comes joint second place to Winamp. Like iTunes, MP3, AAC, and WAV are supported as well as OGG/Vorbis, FLAC, WMA, APE, MPC, CD audio (CDA), ALAS - all as standard. But a simple plugin will allow you to read rarer formats such as VOC, AU, SND, AIF, AIFF, AIFC, IFF, SVX, AUD, and VOX. 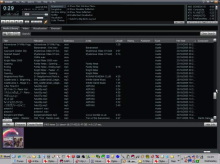 You may also be able to utilize many of Winamp 2's plugins to support more formats; see this thread, and especially this site for a decent list. (not all is smooth though - I sucessfully managed to get various types of MODs working, but MIDI fell short - having a stuttering sound). Finally, MM will convert to OGG, MP3, WMA, FLAC, or WAV, and retain tag information in most cases. Most Winamp fans will probably be chuckling away at this point. 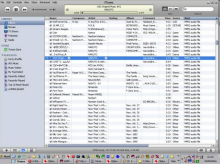 Winamp supports more formats by far than either MediaMonkey, WMP or iTunes. As standard, it can read in (deep breath): 669, aac, aif, aiff, amf, asf, asx, au, avi, b4s, cda, far, flac, it, itz, kar, m2v, m4a, mdz, mid, midi, miz, mod, mp1, mp2, mp3, mp4, mpeg, mpg, mtm, nsa, nst, nsv, ogg, okt, ptm, rmi, s3m, s3z, snd, stm, stz, ult, wav, wma, wmv, wpl, vlb, voc, xm, xmz. Yeah, quite a few. Propriety formats such as Real Audio are also supported if you look around. 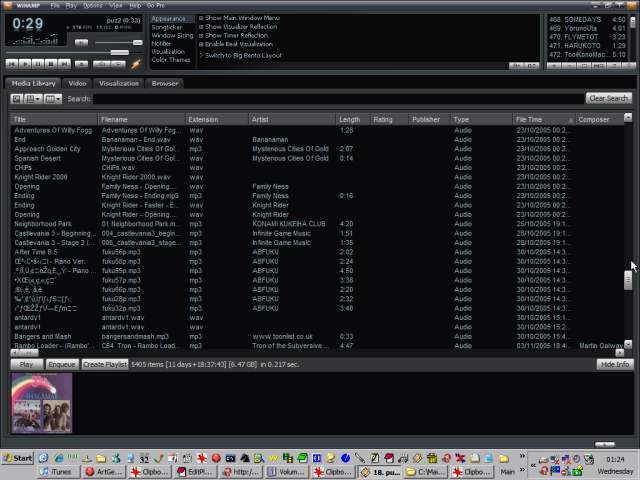 For those who want to listen to music in even more obscure formats, then there are countless Winamp plugins available (.sid, .vgz or .sgt anyone?). Winamp can convert out to MP3, AAC, FLAC, WAV and WMA. 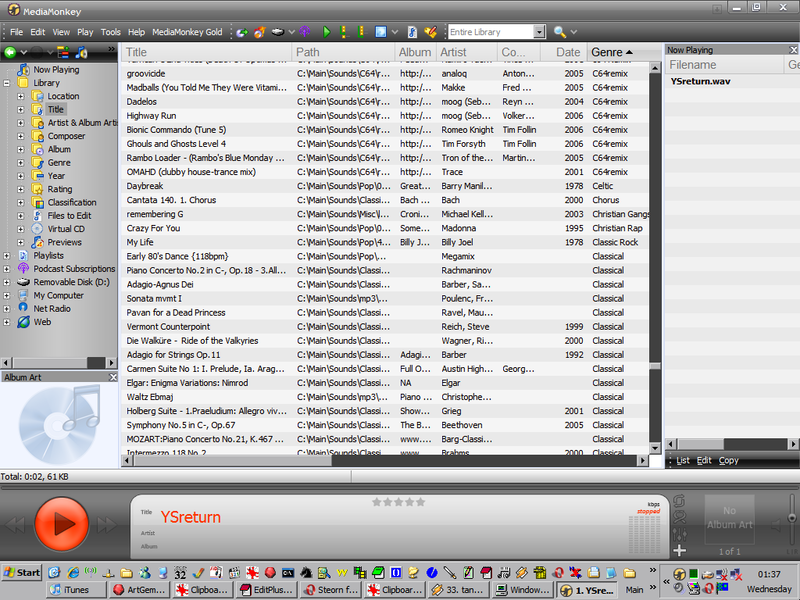 Finally, it would seem Winamp has trouble playing certain types of WAV and AIFF. 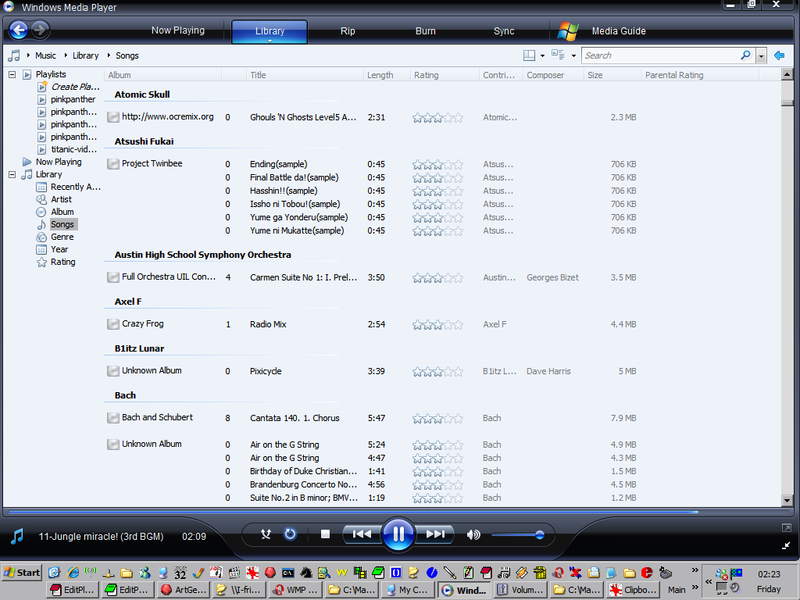 Finally, Windows Media Player comes with a variety of formats on offer. As standard, it can support more formats than Mediamonkey including aif, aifc, aiff, asf, au, cda, m1v, mid, midi, mp2, mp3, mpa, mpe, mpv2, rmi, snd, wav, wm, wma, wmv. With the appropriate codec packs, many other formats including mp4, ra, rm, ram, and ogg/vorbis are available. Even rare formats such as mod or s3m are playable if you hunt around. As far as we know, it's not possible to convert out to other formats. More worringly, it would seem that WMP won't show these other formats (such as MIDI or AIFF) in the main library, despite being able to play them (from a playlist). What's going on? All pictures and text on this page are copyright 2002 onwards Daniel White. If you wish to use any images from this page, please contact me for permission.